In the Silks Poker Room at Tampa Bay Downs this October, players can win some big-money treats at Silks' Annual Halloween Tournament! 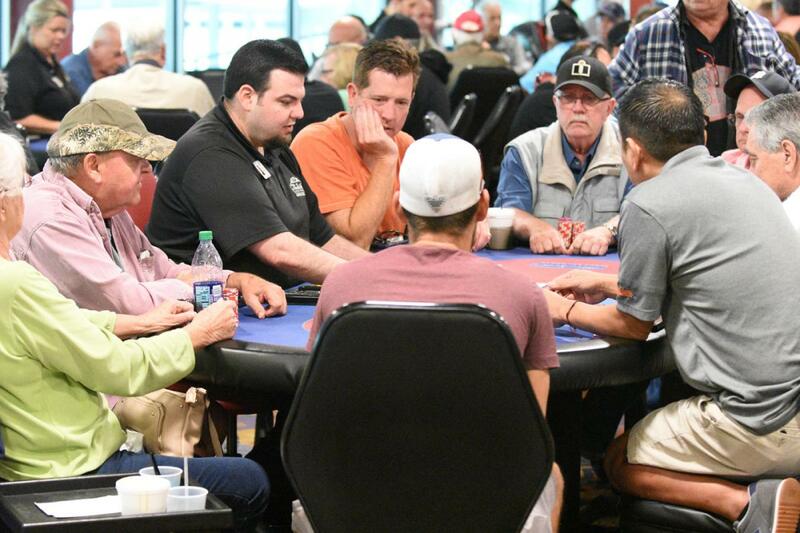 Silks is scaring up a guaranteed $50,000 prize pool for this Texas Hold 'Em poker tournament, and there are several ways for players to get in on the action, with a satellite tournament and even entries available to high hand winners. The Annual Halloween Tournament runs from October 18-21. The buy-in is $175, with an optional $10 add-on available to double your opening stack from 10,000 to 20,000 chips. The tournament will use the new BB Ante format, where the big blind in each hand pays the antes and blinds for the entire table. There are six "Day 1" sessions to help fit the tournament into anyone's schedule. On Thursday, Friday, and Saturday (October 18-20), cards will be dealt out beginning at 1:00 p.m. and 6:00 p.m. Everyone who makes it to the end of any Day 1 session will move on to Sunday's Day 2. (You can buy into one than one Day 1 -- if you survive more than one session, your best stack will come with you to Day 2.) Play will resume at 1:00 p.m. on October 21st and continue until there's a winner. You can also win your way into the Annual Halloween Tournament. On Tuesday, October 16th, Silks will hold a Halloween Satellite tournament where you can win your way into the main event for just $50. (You can spend another $20, payable directly to the prize pool, to double your opening stack from 4,000 to 8,000 chips.) The satellite begins at 7:00 p.m., and play continues until either 12% of the original field remains, or the end of Level 14, whichever comes first. When play stops, everyone who still has chips left gets a $175 ticket for the main event! There are even ways to get into the main event on a single hand! If you have the highest winning hand during Level 3 of the Halloween Satellite, you'll win a $175 main event ticket. Also any straight flush or royal flush in any tournament between October 1-17 will win you an entry to the Annual Halloween Tournament. (On top of that, a royal flush wins you an entry into Silks' $10,000 guaranteed BB ante tournaments, held every other Monday night.) Finally, if you're playing in Silks' weekly $1,000 Mega Stack tournament on Tuesday, October 16, you can win an entry into that night's Halloween Satellite. The three highest winning hands in Level 2 of the afternoon tournament will win a $50 satellite entry. The winning isn't just for tournaments at Silks. During the month of October, Silks will offer daily high hand bonuses, with the Friday bonuses worth $500! And if you join a cash game while the Tampa Bay Buccaneers are in action on October 14th, 21st, and 28th, you can win up to $599 when the Bucs score. Times and rules for the Bucs promo are posted in the Silks Poker Room. As always, the best poker action in Tampa will be found at Silks Poker Room this October. Sharpen your game and come out to try and claim your piece of a guaranteed $50,000 prize pool in the Annual Halloween Tournament!